Are Almonds Bad for Dogs? | Can Dogs Eat Almonds? Have you ever wondered if almonds were safe for dogs? Can you give your dog an almond or use organic almond butter in his interactive dog chew toy? You may have heard that almonds are toxic to dogs, but that statement isn’t totally accurate. Are Almonds Toxic to Dogs? No. But there are some things to consider if you are going to treat your dog with an almond product. Almonds are high in fats and too much fat can cause pancreatitis in some dogs. But too much of anything is never a good idea. Moderation is always key. If given whole, almonds also can pose a choking hazard. The other concern veterinarians may have about almonds and dogs pertains to salt or added preservatives. But, as you know, you should be using organic almonds that contain nothing else. Just almonds. Remember, to always read the entire ingredient panel on the label to ensure you know exactly what is inside. Sure, almonds are a higher fat food, but the almond is actually good for your health in moderation. Almonds contain monounsaturated fats which have been found to help reduce the risk of heart disease. Almonds also are rich in calcium and amino acids. Almonds also act as a laxative and lubricate intestines, making it a good choice to naturally cure constipation. Traditional Chinese Medicine considers the almond an energetically warming food, making the almond a great choice for Ying personalities or during the colder months. Almonds help break up phlegm and mucus. It aids in strengthening the kidneys, heart, and brain. Peanut butter and almond butter are very close in nutritional values fats and calories. However, almond butter actually has lower saturated fat and more vitamins such as vitamin E, magnesium, and calcium. I personally use 100% organic almond butter when I’m looking for a sticky substance or snack for Dexter The Dog. So, move over peanut butter for dogs, and hello, almond butter! 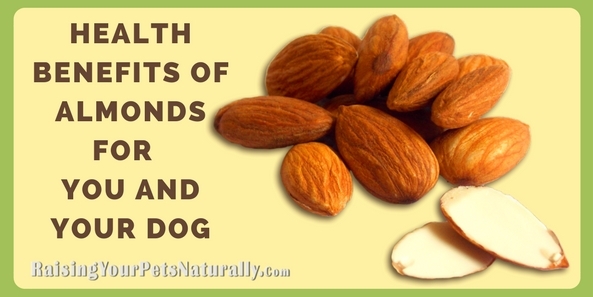 Have you used almonds in your dog’s treats? Tell me in the comments. Almonds have always been my and my family’s favourite but I didn’t know it has such many benefits. I will also feed my puppy with some almonds but hey remember to read the ingredient label to make sure you know what is inside. 🙂 It’s great to know a food we enjoy is actually healthy!